On Friday, JPMorgan Chase & Co. (NYSE:JPM) reported earnings. The banking giant beat on earnings per share and revenue expectations. So did Citigroup Inc (NYSE:C) and Wells Fargo & Co (NYSE:WFC). But guess what? C, WFC and JPM stock all fell on Friday. JPMorgan is earnings billions of dollars per quarter and interest rates are rising, which adds to its bottom-line results. The economy is doing well and increasing but manageable volatility in the stock and bond markets is a boon for its trading desk revenues. Many would think that’s enough to bid JPM stock higher. So why on earth did JPM stock fall? There is a developing concern in the bond market. Specifically, the gap between long-dated Treasury yields and short-dated Treasury yields is shrinking quite quickly, making many nervous that a recession could be on the horizon. While odds of a recession are still low, the worry is very real. While the Federal Reserve increasing interest rates does pad the bottom line for banks, it also ratchets up the yield on short-term bonds. However, for the most part this yield bump is not passed along to long-dated Treasuries. Last week, the 5-year Treasury yield came within 37 basis points of the 30-year, its lowest gap since the financial recession. When short-term notes invert, meaning they yield more than long-term notes, that’s quite bad. That’s when we have trouble on our hands and that could be one reason investors were selling JPM stock rather than buying it — despite great earnings. The bank’s expense ratio fell while sales grew 10.3% year-over-year and net income soared 35%. These are great results, but what can we expect going forward? Analysts estimate revenue will grow 5.2% this year and another 4.7% next year. That’s good, but not necessarily great. So what about earnings? On this front, it’s much better. Estimates call for almost 28% growth in 2018 and another 10% growth in 2019. Should 2019 not falter into a recession, JPM stock should continue climbing, as too could analysts’ estimates. While JPMorgan stock pays out a 2% dividend yield and buys back plenty of stock, I would expect its dividend and buyback program to receive a boost later this year following the Fed’s stress test results. Additionally, tax reform and looser regulations should help the banks rake in even more cash, which should help in its test results and capital return potential. Despite the growth, the yield and everything else going on with JPMorgan stock, shares trade at just 12.2 times 2018 earnings estimates. JPM stock trades at about 11 times forward earnings estimates, which again, is quite low given its growth. With earnings growth outpacing revenue growth, investors can expect improving margins, return on equity and other operational improvements. So what do the charts look like? After breaking down in early February, JPM stock was right back to $116. I thought for sure that we were going to get a solid breakout here. 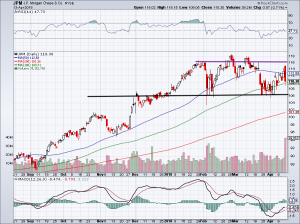 I also thought Bank of America Corp (NYSE:BAC) was set to break out. JPMorgan stock broke out over the $116 level — twice — but ultimately failed both times. Eventually support came into play around $106. Shares originally opened higher on Friday following JPMorgan’s earnings, but fell about 3% down to $110. 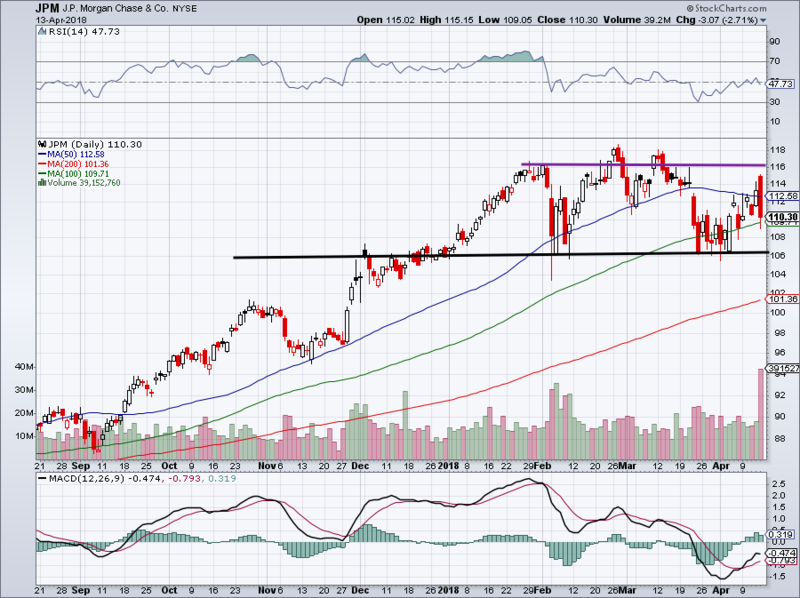 Still above last week’s lows, the hope is that JPM can retest and break through $116. With BAC, Goldman Sachs Group Inc (NYSE:GS) Morgan Stanley (NYSE:MS) and other banks reporting next week, perhaps they can give JPM a boost. I, for one, think the stock should be higher, not lower on the results, but I am not the market; we have to trade what’s given to us. Below $106 and short-term, risk-averse investors have to consider parting ways with JPMorgan stock. But note that the 200-day is close by and could be support as well. With this growth and valuation though, I admit it’s hard to be a seller at lower prices. Bret Kenwell is the manager and author of Future Blue Chips and is on Twitter @BretKenwell. As of this writing, Bret Kenwell held a long position in JPM stock. 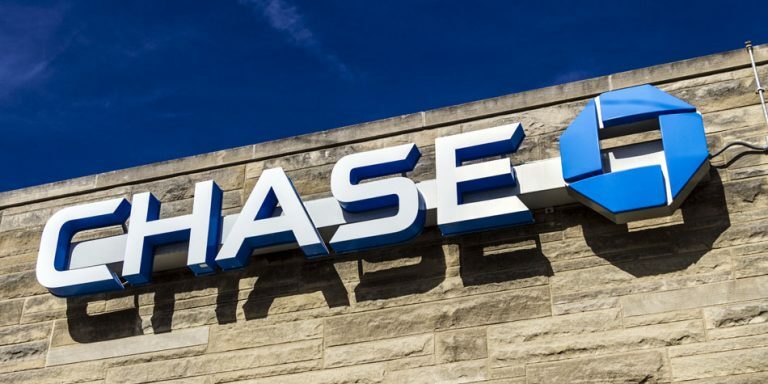 Article printed from InvestorPlace Media, https://investorplace.com/2018/04/jpmorgan-chase-co-up-on-earnings-not-down/.